I read the uncharted path a little while ago and wrote the review but forgot to publish it. (sorry Rachel!). I wanted to go back and talk about some specifics but first I'll publish the original review. The uncharted path is an autism biography like none I've ever read. Unlike similar books, Rachel's main journey takes place during adulthood. The book certainly covers Rachel's childhood but it's clear that the main changes occurred much later in her life. This allows for much more mature reasoning processes and as a result, the decisions she makes carry greater significance. More than any other book I've read, "The Uncharted Path" takes the reader out of their comfortable world and puts them right behind the eyeballs of a woman awakening to her place on the autism spectrum. 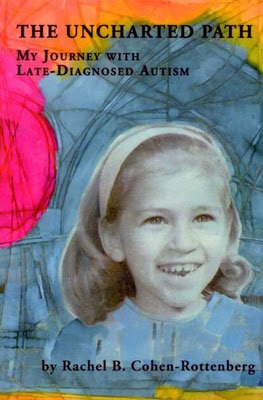 The book fleshes out many of the less obvious aspects of the female side of autism. In one section, there are somewhat ambiguous quotes from Professor Tony Attwood alongside real-world examples from Rachel's life. Rachel's examples make it easy to make sense of the more complicated and less documented aspects of autism. In other sections, we see through Rachel's eyes as she goes about her day-to-day activities. We see the impact that autism has on each of these and the immense pressure on her to conform to neurotypical social norms. The uncharted path however is not about conformity; it's not even about wanting to conform. Instead, Rachel opens her arms to the entire autism spectrum and embraces it in a way I've not seen before. It's common for people on the spectrum to embrace some of the high-functioning aspects while complaining about the worst of the side-effects. The uncharted path doesn't avoid these obstacles however, it meets them head on. It accepts them as part of the tapestry of autism. Even the side-effects have a part to play. Following on from Rachel's acceptance are amazing stories of how she has been able to lessen the negative impact and reclaim her life without compromising her individuality. It's a very different type of reclamation that I'm used to hearing about. It's much more common for people on the spectrum to hide their differences and pretend to be normal in order to find social acceptance. Rachel has already been there. In fact, she spent nearly fifty years pretending to be someone else. Her thoughts and resources explaining how this near-perfect camouflage broke down are astounding - and frightening. They've certainly led me to reconsider my own precarious existence. This leads us of course, directly back to "the uncharted path". Ultimately, it's the path of self-discovery. I'd recommend "The Uncharted Path" to anyone on the spectrum, to anyone who has friends or relatives on the spectrum and to anyone who cares for people on the spectrum. Unlike authors of many "aspergers" books, Rachel covers the wider spectrum. Her writing is clear, concise and interesting and provides many astounding insights. Best of all, it's a book written straight from the heart. The Uncharted Path is available from amazon and from Rachel's blog. Rachel's blog is now at http://www.disabilityandrepresentation.com/. Wow. As a recently sort-of-diagnosed woman who like she's spent the last 32 years pretending to be someone she isn't just so no one would notice how different she was, I think I definitely need to find and read this book. She also has a really inspiring blog, so nice for me to read someone who appears to be able to use reasoning skills...a very scarce resource among humans . While I haven't yet read the book, I loved Rachel's recent post Am I more than my Autism? I refuse to answer the question". Thanks very much for leading me to another great writer. thanks for this post gavin. i'm curious to read this, get a better sense of how she views her diagnosis, the way it's impacted her life. it's so great that you're educating people about books, films on the spectrum, so thanks again. I'm a parent of a son with asperger's (he's only 3 so this is all new to us) but I'm going to get the book now. Thanks for the review! Rachel's new web site is called Disability and Representation. Since my diagnosis at the age of 24, I've made a conscious effort to stop trying to pretend "neurotypicality". If I'm more comfortable teaching with my shoes off and sitting on the back of a couch then why shouldn't I? If I need to rub something soft on my face in front of people or flap or clap my hands to stim then I don't try to hide it anymore. Autism is a part of who I am and I've always believed that I should never try to hide who I am. I'm myself, in my most honest and truest form and I don't know when the people around me convinced me that that was a bad thing. Now, I've learned the joys of not " passing as neurotypical " anymore. This is who I am, weirdness, stims, quirks and meltdowns and all! Article: A School Example - Kaelan's Bad Day.